I pinned this recipe on Pinterest because it looked beyond delicious. I'm a lover of oatmeal, saving time in the morning and... again... things which look delicious... so it really appealed to me. Last week when I finally went to make some, though, I was dismayed to see the massive amounts of milk in the recipe. I'm casein-intolerant so I can't have dairy. It's horrible. I love ice cream. Every single kind. And don't get me started on cheese. It's a food tragedy. However, I discovered that you can completely remove the yogurt aspect and sub in the milk of your choice. In my case that alternates between almond + coconut. Soy + rice would work as well! I've made this a few different times and wanted to share some of the recipes. Ready? Let's go. To make it, you just need a one-to-one ratio of milk to oats. After that you can add in anything you'd like. For the step by step I used chocolate-peanut butter-coconut, so we'll move through that and then have alternate recipes at the bottom. (1) Layer it. 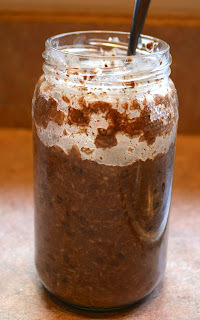 For this recipe I used 3/4 c. oats and then layered all of the ingredients on top (chocolate powder, coconut flakes, flax seeds, cinnamon, peanut butter. How fun would it be to make a bunch of these dry and leave out the milk, label them with something pretty and give them away as gifts? Or, just get them ready in advance for the week, put the tops back on and each night pull one out for final preparation. I use old jam jars. We go through a lot of jam because John has 2 PB + J's every.single.day. I like them better than mason jars. Mostly because mason jars are trendy. Secondly because my jam jars are free and require zero trips to the store. (2) Milk it. 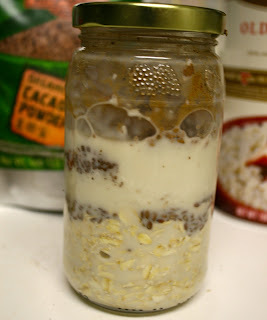 The night before, add in the milk of your choice using the 1 to 1 ratio of oats to milk. In my case, that was 3/4 c. again. (3) Refrigerate it. Mix everything up and put it in the fridge til the next morning! ** optional** add sliced bananas the day of. Try blueberry, raspberry, strawberry, mixed... any jam you like! Add in mangoes, peaches, fresh berries, bananas... anything! I like this because the natural sugar in the fruit is enough to sweeten without any excess sugar added. Week: Over. I can't believe how quickly it has gone by! Nearly makes me want to cry. I hope your week was good to you. I have a lot of free time next week, so I plan to take on some bigger projects that I haven't been able to conquer yet. And I want to organize my home. And I'm getting a tattoo touched up. And I want to go to the beach. And, and, and. That's how you take an empty week and make it full, people! Have a great weekend, see you next week and as always, thanks for reading! Hi, i just discovered your blog with your fast-to-make Jersey dress. I have to taste your recipe... When do you eat this? For breakfast or as a treat while tv watching? This looks delish! Do you heat it up in the microwave before you eat them in the morning? Love your blog btw..I just found it and I have a feeling I will be reading for a while! Vanessa- I hope you do stick around! <3 I eat mine cold or at room temperature. I don't see any reason why you couldn't heat it up? I just have an issue with microwaves, they change the molecular structure of food... which makes me nervous. Thank you sweetie! I too deal with the dreaded lactose intolerance and cannot eat any of my beloved dairy. I just saw this recipe on another site and was so disappointed that it was made with yogurt and milk. Imagine my delight when I googled dairy free and your recipe popped up! DF ladies unite! I feel you! it seems like every delicious recipe involves dairy... but one by one, we'll convert them all!